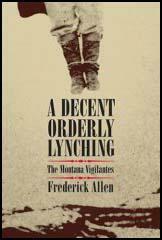 Lynching is the illegal execution of an accused person by a mob. The term lynching probably derived from the name Charles Lynch (1736-96), a justice of the peace who administered rough justice in Virginia. 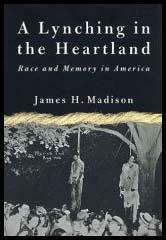 Lynching was originally a system of punishment used by whites against African American slaves. However, it was a common punishment for horse and cattle rustlers in the 19th century. Men caught committing the crime were often hanged on the spot without the benefit of a trial. Sometimes prisoners were dragged from jail by a lynch mob and executed. Bill Longley , a notorious outlaw in Texas, was captured by vigilantes he was lynched as a horse thief. However, as the mob rode off, one man turned and aimed a shot at Longley, the bullet missed and hit the rope and weakened it. The weight of Longley's body broke the weakened rope and saved his life. However, he was officially hanged in Texas in 1878. There were occasions when people were lynched for political reasons. For example, on 20th July, 1889, James Averell and Kate Watson were lynched on the orders of Albert J. Bothwell, a powerful cattleman in Wyoming. Averell and Watson had become involved in a dispute with Bothwell over land. Bothwell responded by organizing a mob to lynch Averell and Watson for rustling. I presume you will have heard of another murder in our town, and of course it will be exaggerated. I will tell you just exactly what it was. During the evening of the 11th, a man by the name of Fitzpatrick kept shooting on the street, endangering the lives of people who were passing, he also stopped several persons on the street putting his pistol against them and threatening to shoot. At 3 a.m. when the cars from the west came in he fired a shot through them and then went to the saloon at which for about one week past he has been employed. He there found a man sleeping by the name of William Bryson; he shook him and waked him up and asked him how he came there. The man had been in the habit of sleeping there, and replied that he came in through the window. Fitzpatrick then struck him over the head with his revolver and on his getting up and endeavoring to escape fired at him, striking him in the groin. Bryson lived until about 8 a. m. and died. The coroner's inquest found a verdict of murder in the first degree! and the citizens turned out en masse, and at 1 p. m. took Fitzpatrick from the jail and proceeded to the river bank and hung him to the old historic cottonwood. Previous to being hung, he gave his name, age and place of residence, said that he was ready to die; that he had stabbed a great many men. He never paled or showed the least fear but braved it through to the last. He came here about one week since from Sheridan, having been warned to leave there. His people live in St. Louis. Pond City this morning, about two o'clock, John Langford was taken out by the Vigilance Committee to be hung for his crimes. On ascertaining his certain fate, he told them he did not want them to hang him, and that he would hang himself; so he pulled off his boots, put the rope around his neck, climbed the tree and jumped off. Before doing this he acknowledged to killing six men, and said if he had had his fate postponed a few days he would have killed as many more. On being requested to make his peace with his Maker, he replied that if he had a Maker it was a damned poor one, as he had experienced considerable trouble in the last few years. He also said he would meet them all in hell, but none of them should gain admission except with hemp ropes ornamenting their necks. Langford was about twenty-two years old and was half Indian. He had led a desperate life all over the border. 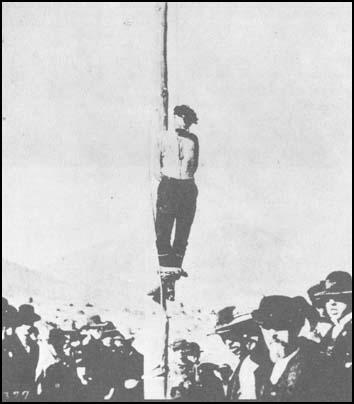 John Heath lynched by a mob in Tombstone in 1884. At the mining towns up above this nobody is thought anything of who has not killed a man - i.e. in a certain set. These women had a boarder, only fifteen, who thought he could not be anything till he had shot somebody, and they gave an absurd account of the lad dodging about with a revolver, and not getting up courage enough to insult any one, till at last he hid himself in the stable and shot the first Chinaman who entered. Things up there are just in that initial state which desperadoes love. A man accidentally shoves another in a saloon, or says a rough word at meals, and the challenge, "first finger on the trigger," warrants either in shooting the other at any subsequent time without the formality of a duel. Nearly all the shooting affrays arise from the most trivial causes in saloons and bar-rooms. The deeper quarrels, arising from jealousy or revenge, are few, and are usually about some woman not worth fighting for. At Alma and Fairplay vigilance committees have been lately formed, and when men act outrageously and make themselves generally obnoxious they receive a letter with a drawing of a tree, a man hanging from it, and a coffin below, on which is written "Forewarned." They "git" in a few hours. When I said I spent last night at Hall's Gulch, there was quite a chorus of exclamations. My host there, they all said, would be "strung" before long. Did I know that a man was "strung" there yesterday? Had I not seen him hanging ? He was on the big tree by the house, they said. Certainly, had I known what a ghastly burden that tree bore, I would have encountered the ice and gloom of the gulch rather than have slept there. They then told me a horrid tale of crime and violence. This man had even shocked the morals of the Alma crowd, and had a notice served on him by the vigilants, which had the desired effect, and he migrated to Hall's Gulch. As the tale runs, the Hall's Gulch miners were resolved either not to have a groggery or to limit the number of such places, and when this ruffian set one up he was "forewarned." It seems, however, to have been merely a pretext for getting rid of him, for it was hardly a crime of which even Lynch law could take cognisance. He was overpowered by numbers, and with circumstances of great horror, was tried and strung on that tree within an hour.